My husband’s cousin and his wife had us over for dinner a few years ago and made us this delicious dish. (Thank you Ai- you always inspire me with your cooking skills and Ben always loves what you make!) It has now been a staple in our monthly meal planning like so many other of the dishes I’ve tried. I tend to get a recipe I like and make it several times over depending on my husband’s opinion of the meal. 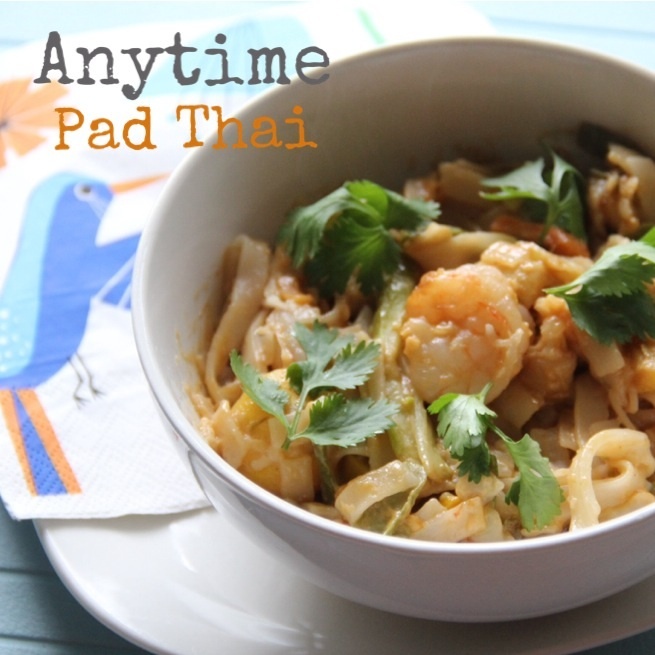 I also am one who likes to make certain recipes in certain seasons….this one we eat anytime (hence the name). This recipe requires a few ingredients a person might not always have stocked in their pantry or fridge, but I promise you it’s worth it. I’ve found some items in substitution that have worked really well so I’ll tell you more about them. Here goes! Here’s a picture of the items I’ve used that might not be on everyone’s radar who doesn’t do Asian cooking all that often. I also see that I used large sized noodles when I made this last. You can use either medium or large depending on your preference. Also you don’t use a lot of the chili garlic sauce so one jar will last several times for this recipe. 1. 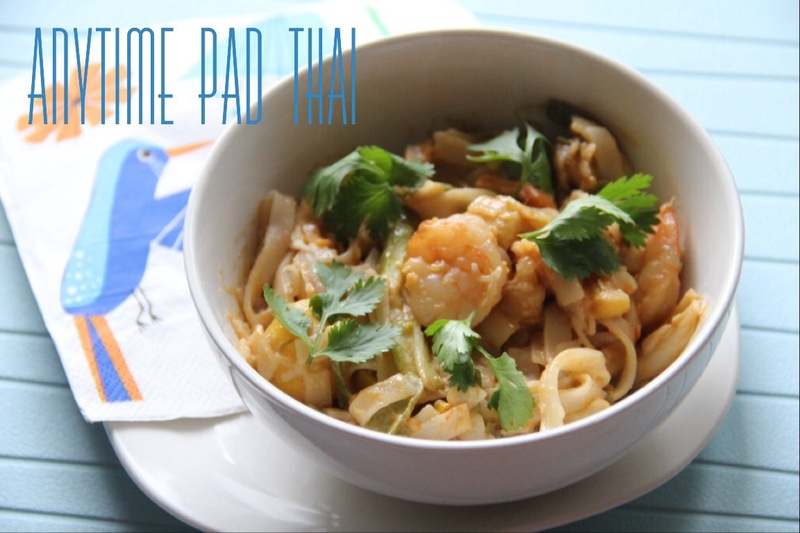 Start by whisking the water, peanut butter, soy sauce and chili paste together in a small bowl. You can choose to add more heat if you like it spicy by adding more chili paste. Set aside. 2. 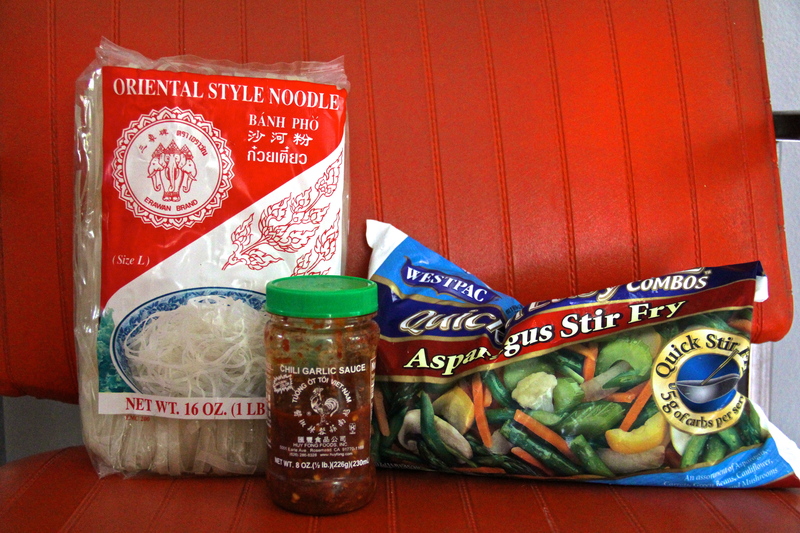 Soak your rice noodles in warm water until softened or cook according to the package instructions. Drain and set aside. This can be at the same time as you are cooking the rest of the food. 3. In a large wok, heat canola oil over medium-high heat. Add the garlic and ginger ( if using) and let it cook for 1 minute. It’ll start to smell fabulous in your house. 4. If cooking with chicken, add that to the pan and cook thoroughly. 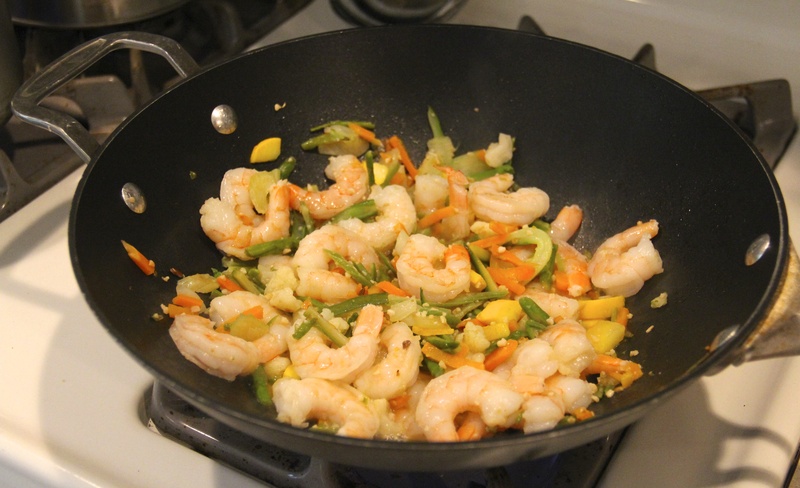 Once the chicken is done, add your veggies and shrimp. Cook until heated through. Frozen veggies take a little longer for obvious reasons, but at least you didn’t have the trouble of having to cut up all the veggies. 5. 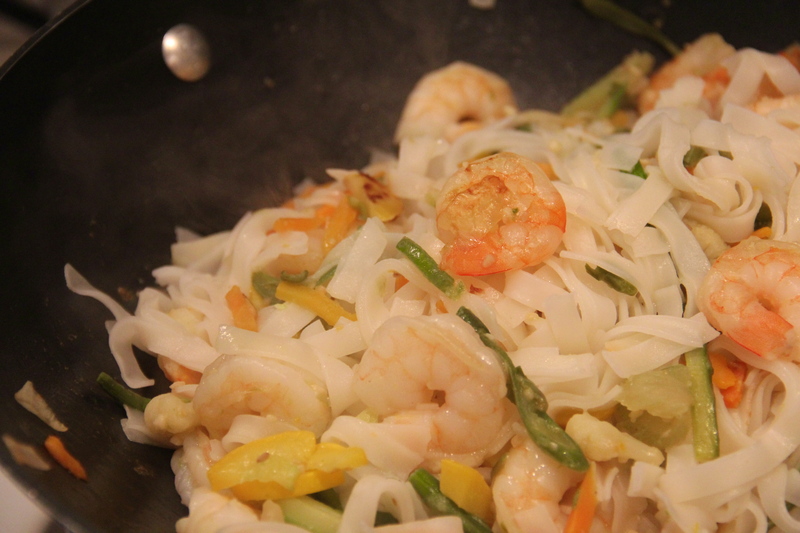 Add your drained noodles to the wok and toss. 6. Add the peanut/spice paste along with the brown sugar and cider vinegar. Toss to distribute and cook for about 2 minutes to allow everything to be heated through. 7. Serve it up and garnish as you choose. 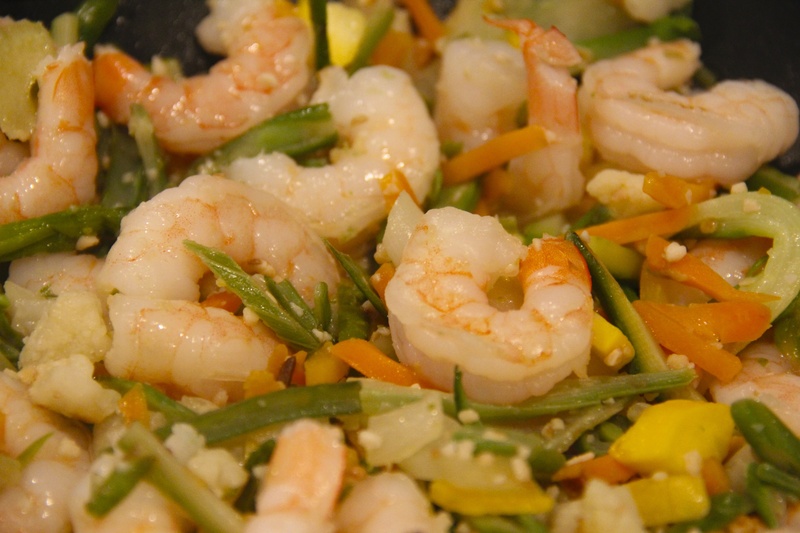 I chose to make it this time with just shrimp since I was out of chicken. I ended up just putting more shrimp in to compensate. I love colorful food. Makes it more pleasing to the eye. That’s what’s for dinner. If you try this out, let us know how it went. Also if there are any fun variations you have- tell us those as well. I have to try this recipe!! Maybe in our outdoor kitchen:) yay!